After a field trip to Stone Ridge Orchard with his nursery school class last week, he's been talking a lot about picking "the biggestest apple." So when yesterday morning dawned all gorgeous - sunny and blustery and classically autumn, we headed back to Stone Ridge to give him another shot at that "biggestest" apple. 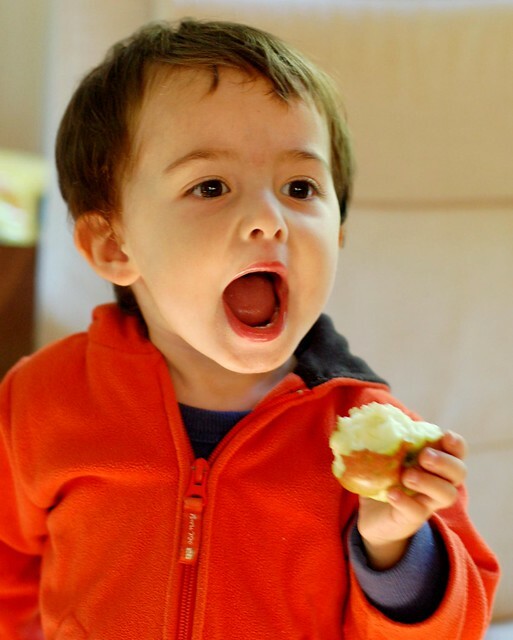 Although I did not get a picture of it (photo below is of him with a much smaller apple), he did pick an enormous Ida Red that was approximately the same size as his little head - it kept him happily occupied for the entire car ride home. And we picked about 15 pounds of pommes. 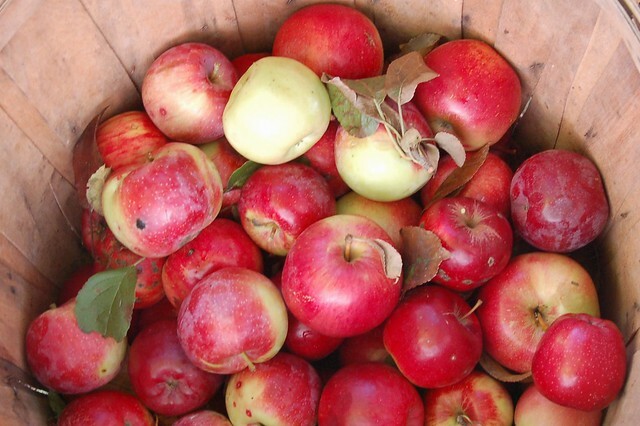 I used some of them to make apple crisp, one of our family's favorite desserts. 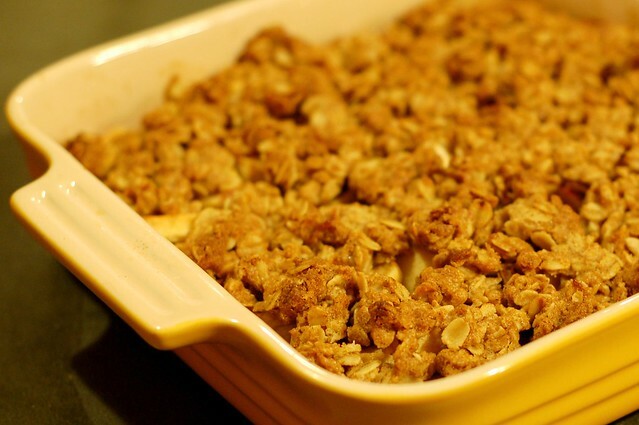 The combination of oats, butter, apples, sugar, vanilla, cinnamon, cloves and lemon juice is hard to beat. 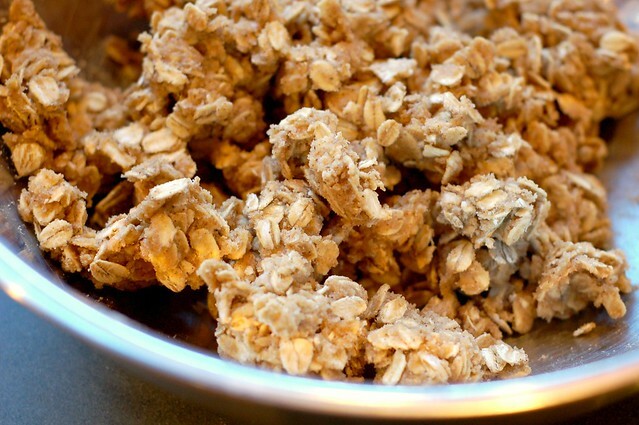 You can also easily make this gluten-free by being sure to choose gluten-free oats, and you can also make it dairy-free and vegan by substituting coconut oil for the butter - the flavors go beautifully together. And being naturally lazy, I also appreciate how easy it is to make. A little peeling, coring and chopping takes care of the filling. Some mixing and clumping with your fingers does for the topping. Then you plop the topping on the filling and shove it in the oven. No need to tangle with (or clean) the Cuisinart or the rolling pin. Shortly afterwards, mouth-watering smells begin to waft from the oven, filling your home with the essential aroma of comfort. And 45 minutes later you've got a heavenly dessert ready to serve with some ice cream. 1. Preheat the oven to 375°F. 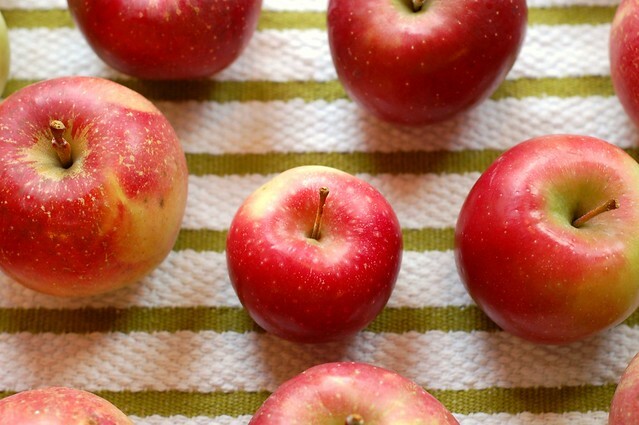 Toss the apple slices, lemon juice, and vanilla in a large mixing bowl. 2. 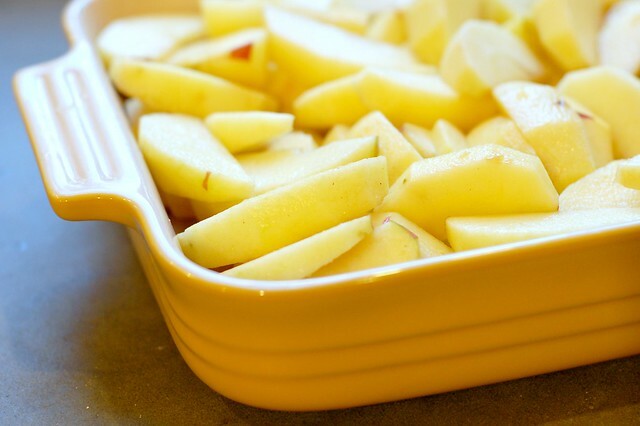 Layer the sliced apples in a 9 x 12-inch baking dish. 3 Combine the butter, brown sugar, cinnamon, cloves, nutmeg and oats in a bowl and stir well to combine. 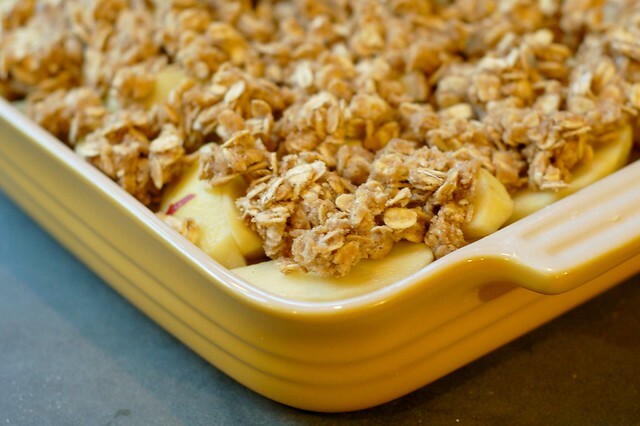 Crumble the topping over the apples.